A 47-year-old woman presented with pain in the ball of her feet on weight-bearing. She works as a nurse and walks most of her 12-hour shift. Few months ago she noticed deformity of the digits in her feet. On examination it was noticed that her deformed digits are contracted with a nonreducible proximal interphalangeal joint and reducible metatarsophalangeal (MTP) joint. The picture is shown above. 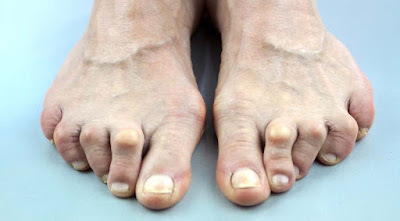 She was referred to a podiatrist who diagnosed hammer-toe deformity. 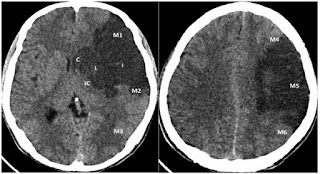 A 68-year-old man with a history of hypertension and coronary artery disease presents with right sided weakness, sensory loss, and an expressive aphasia. Neuroimaging studies are shown. In the emergency department the patient’s blood pressure is persistently 160/95. 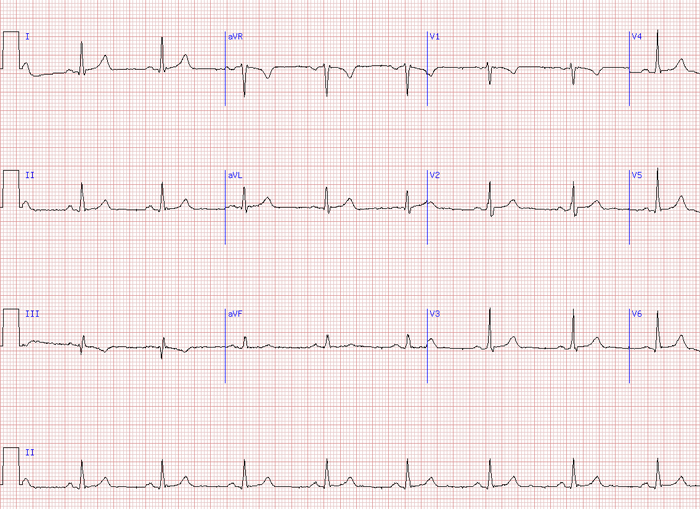 Which of the following is the best next step in management of this patient’s blood pressure? b. Administer oral clonidine 0.1 mg po until the blood pressure drops below 140/90. c. Observe the blood pressure. 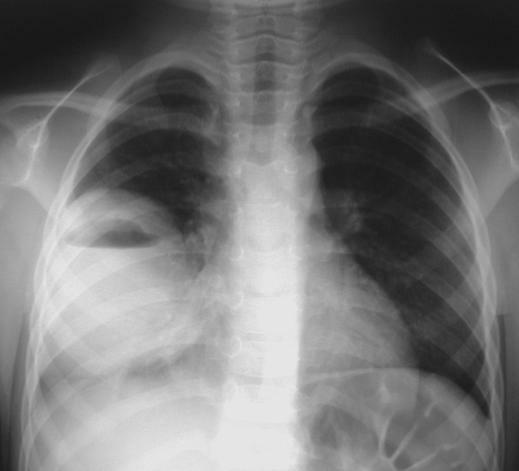 A 42-year-old alcoholic man develops cough and fever. Chest x-ray is shown below which shows an air-fluid level in the superior segment of the right lower lobe. Which of the following is the most likely etiologic agent? This 50 Year old lady presents to her doctor with a slowly growing painless lesion on her face. 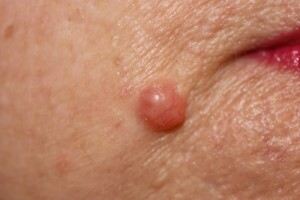 The lesion is shown in the picture above. What is the most probable diagnosis? This 7-year-old boy presented with history of difficulty in standing up and had delayed motor mile stones. 1. What is the sign called which is shown in the picture above? 2. What is the most probable diagnosis? 3. What is the prognosis of this disease? 4. Which cardiac problem is likely in such children? 5. Why males are exclusively affected? Answer: The most probable diagnosis is Duchenne muscular dystrophy (DMD). Presence of prominent calf muscles in a boy with classical Gower’s sign and history of delayed motor mile stones is very much suggestive of Duchenne muscular dystrophy. Presence of raised CPK and absence of dystrophin in muscle biopsy would confirm the diagnosis. is fully manifested by 6 years. Along with the weakness of the muscles in lower limbs there is also weakness of the shoulder girdle muscles in these children. Pain is usually not associated with this weakness. Mental retardation is usually found to be associated with this disease. Hypertrophy is observed in tongue and the muscles of forearm in addition to the obvious hypertrophy of calf muscles. Though they appear hypertrophied but are actually weak in strength.Similarly, intellectual impairment occurs in all patients although only 20-30% have IQ less than 70. CPK is raised classically and muscle biopsy reveals degeneration of muscle. If CPK levels are high in a child suspected to suffer from DMD then there is high probability of DMD. But if the CPK levels are normal then it definitely excludes the possibility of DMD in the child. Thus high level of CPK increases the possibility of DMD but the final confirmation of the diagnosis is possible only if the muscle biopsy reveals too low level of dystrophin in the muscle. Answer: This disease has a relentless progressive course. It ultimately results in bed ridden state of the child. Child in later stage is even unable to comb his hairs. Death usually occurs by about 18-20 years. The cause of death may be respiratory failure in sleep, intractable congestive cardiac failure, pneumonia, aspiration or airway obstruction. Maintenance of good nutrition and physiotherapy are the mainstays of its management. Steroids have no role in its management. Myoblast transfer is the latest technique being tried for its management. Its success is yet not established. In it myoblasts from the normal muscles of close but unaffected relatives usually the father is cultured in vitro. It is then injected in the dystrophic muscle. Simultaneously, the patient is immunosuppressed to prevent the rejection of the graft. 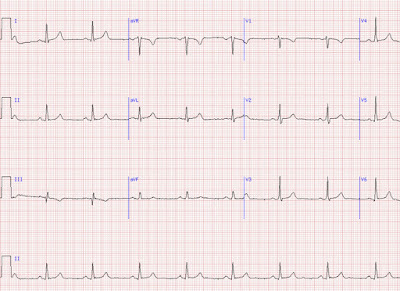 Answer: Cardiac assessment is important in these patients as cardiomyopathy is usually associated with it. It is a constant feature of DMD. is mostly seen in boys. 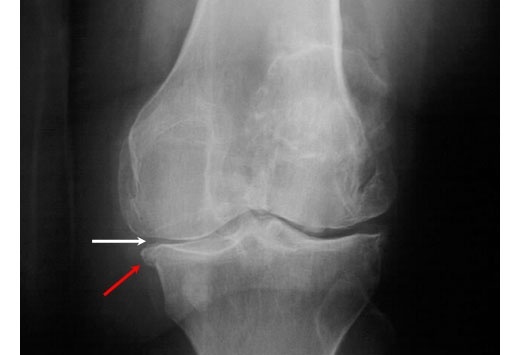 A 78-year-old woman with mild renal insufficiency complains of pain in her knee joints on walking. The pain interferes with her day-to-day activities and is relieved by rest. There is no redness or swelling. 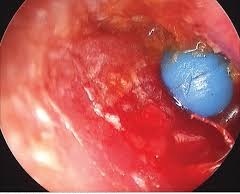 There is minimal joint effusion. ESR and white blood cell count are normal. Which of the following is the best initial management of this patient? What is the most likely pathogenesis of her condition? A 3-year-old girl is brought by her parents to an urgent care facility after a day of crying, irritability, scant otorrhea, and frequent pulling of her right ear. using an operating microscope for visualization. ~ Inanimate objects such as beads , cotton tips, paper, toy parts, crayons , eraser tips, food, or organic matter, including sand, sticks, and stones as well as sometimes insects.